chickemole (aka avocado chicken salad) | Is there any wine left? This is a really delicious twist on chicken salad and makes a great sandwich, but I really love it served as a dip with tortilla chips! Put the chicken in a baking dish and cover with buttermilk. Bake at 350 for 45 minutes – 1 hour, until the chicken is cooked through. Cooking it in the buttermilk makes it tender and keeps it moist. FYI, the buttermilk will separate and look like it is curdled. It isn’t. It is fine. Its just what happens when it gets hot. Once the chicken is cooked, remove it to a cutting board and let it cool. Meanwhile, we’re going to make guacamole. I like to mash about half of my avocados before adding all of the other ingredients so they have a semi-smooth consistency. 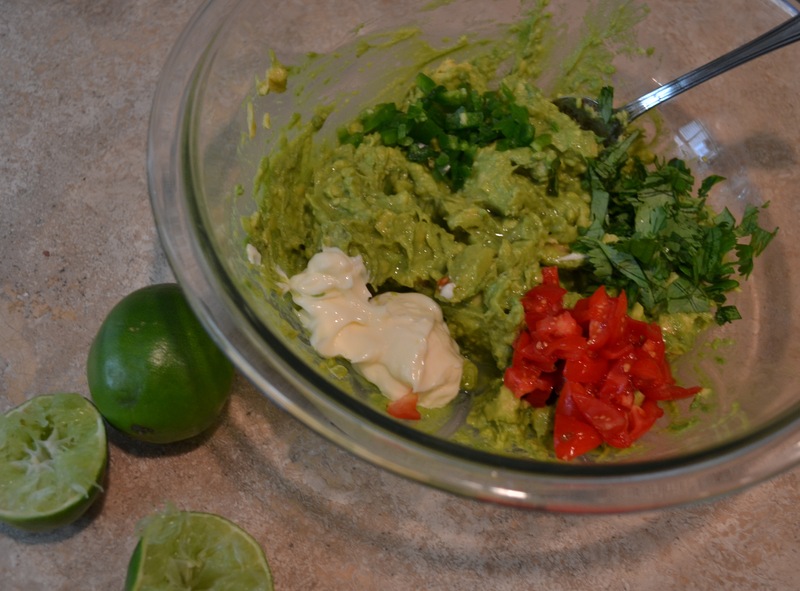 Add the other half of the avocados (which have been chopped rather than mashed), along with the jalapeño, cilantro, tomatoes, lime juice, salt, pepper and mayonnaise. Once it is well-combined, grab a chip and taste it. If it needs more of anything, add it now as it will be harder to mix in once the chicken has been added. Back to the chicken. Grab two forks and shred, shred, shred. 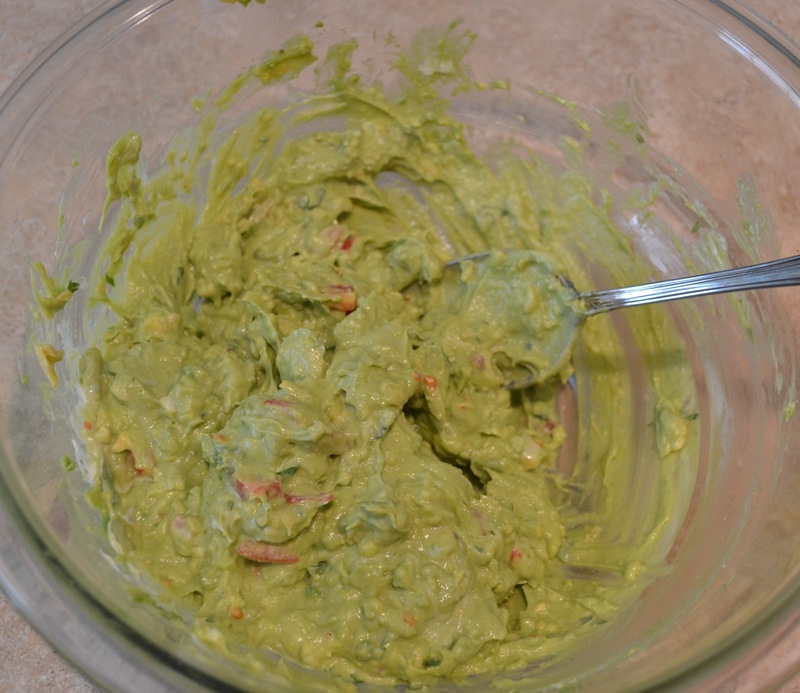 Add the chicken to the guacamole and mix well. Give it one more taste for seasoning before serving. Tip: If you want to make it a day ahead, spritz the top of the mixture with lime juice, then press saran wrap onto the surface of it before refrigerating. That will help it keep its bright green color. 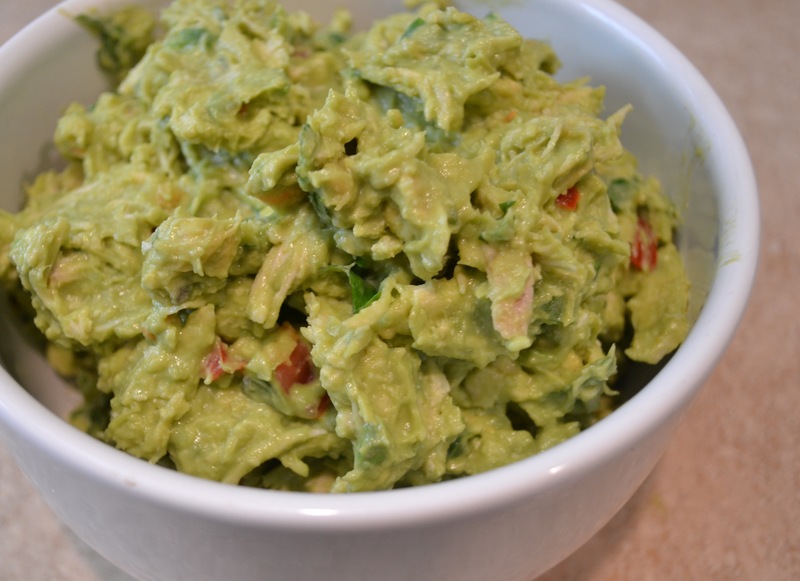 Disclaimer: I super-love avocados so I tend to make this more like guacamole with chicken in it, rather than chicken salad held together by avocados. 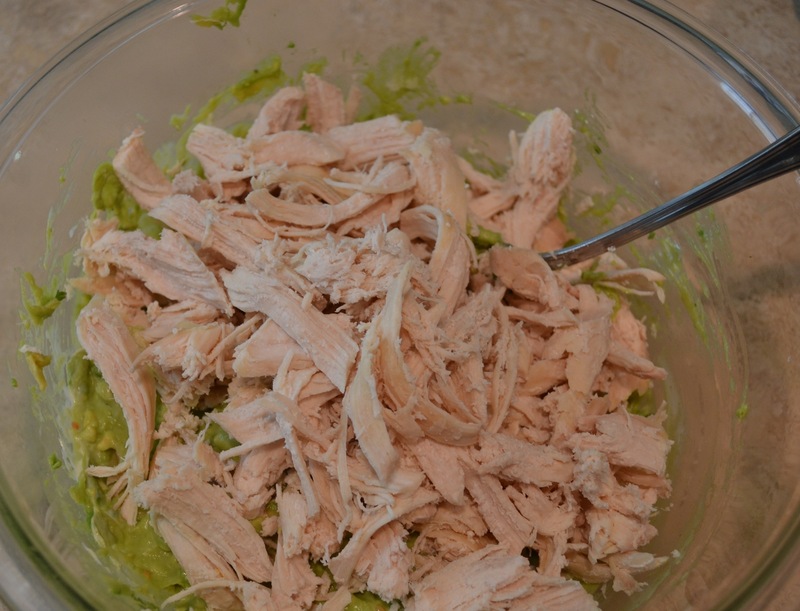 If you want it to be thicker and more like chicken salad, add more chicken or less avocados. Put the chicken in a baking dish and cover with buttermilk. Bake at 350 for 45 minutes – 1 hour, until the chicken is cooked through. 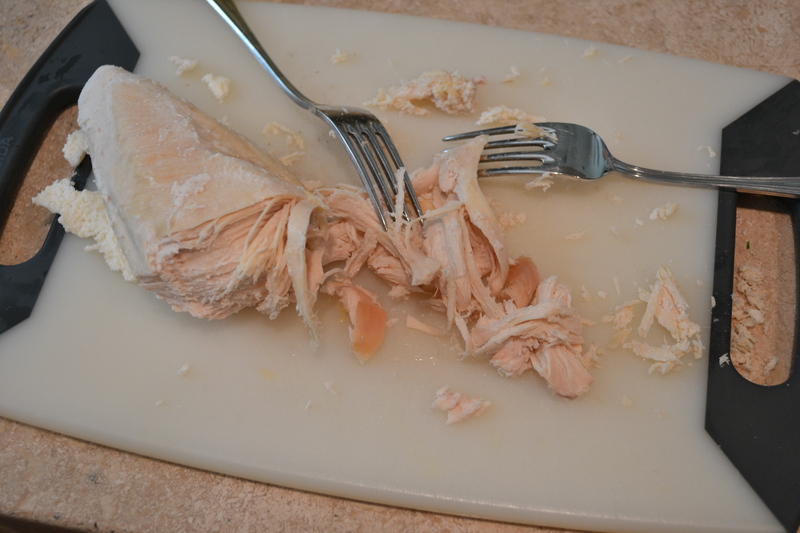 Once the chicken is cooked, remove it to a cutting board and let it cool. Mash about half of the avocados in a medium sized bowl. 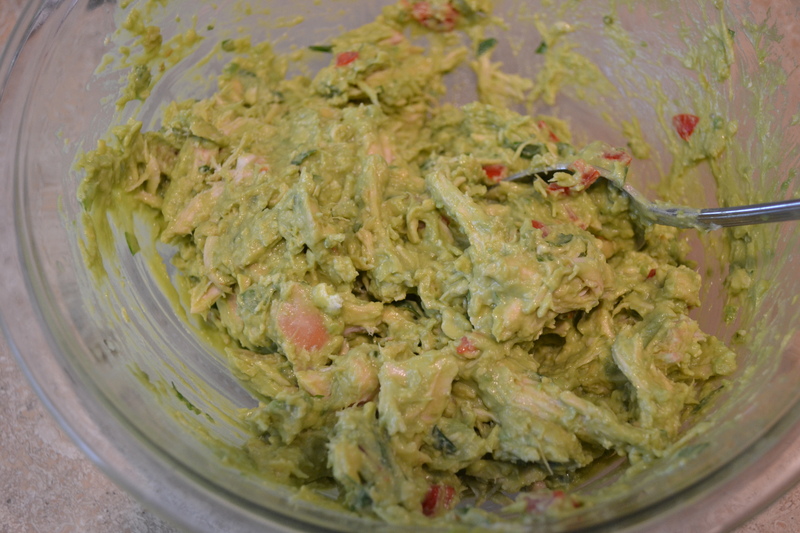 Add the other half of the avocados (which have been chopped rather than mashed), along with the seeded and chopped jalapeño, chopped cilantro, diced tomatoes, lime juice, salt, pepper and mayonnaise. Mix well. Using two forks, shred the chicken breasts, then add them to the avocado mixture. Mix to combine. Serve immediately on sandwiches or with chips. I prepare this all the time myself. Instead of plain salt I add just a hint of garlic salt and a quicker way to shred the chicken is to put it on a big wooden board and chop it finely with a butcher knife…it only takes about 2 minutes to shred an entire breast using this method. Also to keep avocados green always keep the bone in the bowl or when only using half an avocado just refrigerate the half that has the bone intact.